Geek Image of the Day!!! Yoda+Ewok=Gizmo!!! 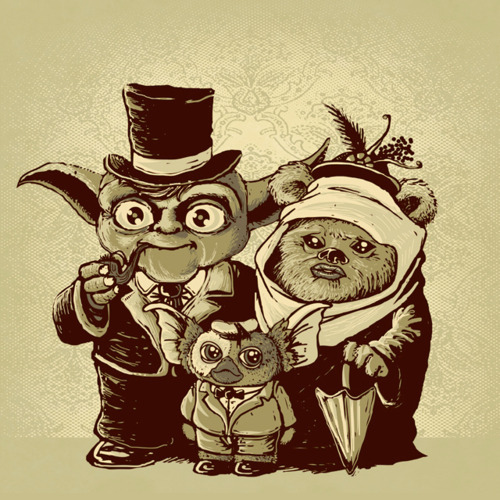 “Father Yoda, his Ewok wife and their son Gizmo get together for a family photo in this awesome shirt design by Vincent Bocognani.” I never thought…but this just seems right. I mean they are all somewhat related. Love it. I love the Victorian/British theme this sci-fi family has been given. I always thought Yoda needed to have a pipe of some sort. Maybe the longbottom leaf? Geek Image of the Day!!! Tarantino VS. Coen Bros.!!! This entry was posted on Thursday, August 18th, 2011 at 3:52 pm	and is filed under News. You can follow any responses to this entry through the RSS 2.0 feed. You can skip to the end and leave a response. Pinging is currently not allowed. « Take A Look at the ‘Suing the Devil’ Trailer With Your Favorite Droog, Malcolm McDowell!! !